For today, I wanted to share with you my little secret for lovely brassy-free hair aaaand it is this L’Oreal Professionnel Série Expert Silver Shampoo (£8.10 / $13,37 for 250 ml). A couple of months ago I decided that I wanted to go back to my lighter, highlighted blonde hair and I absolutely love how it looks on me! However, one problem that many fellow blondies have is that the beautiful color, which we leave the salon with often looses its prettiness shortly after and we’re left with a yellowish / brassy locks. Every time I highlight my hair I also tone it so that the nasty yellow tones stay at bay for longer. 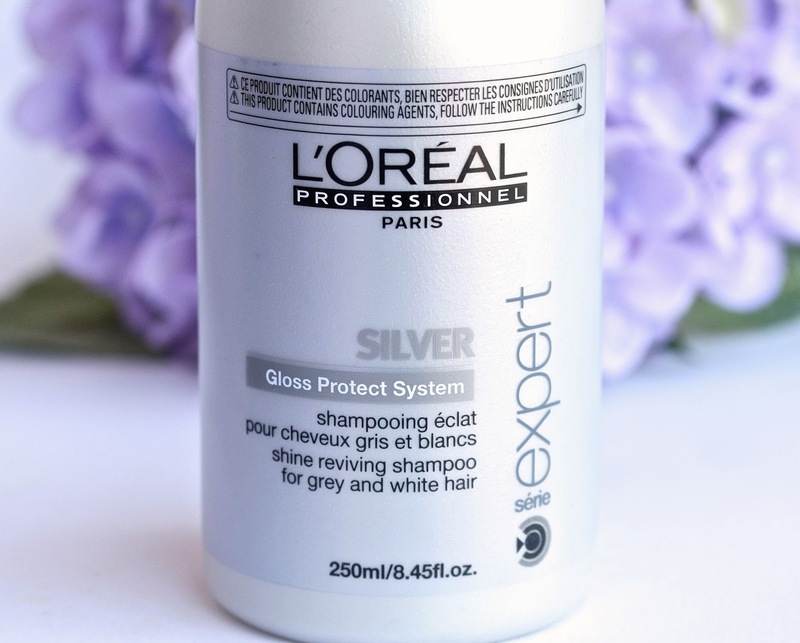 After two weeks though my hair always gets a bit brassy (which I absolutely hate) and then the only way to keep it nice and ashy is with this Silver shampoo from L’Oreal. 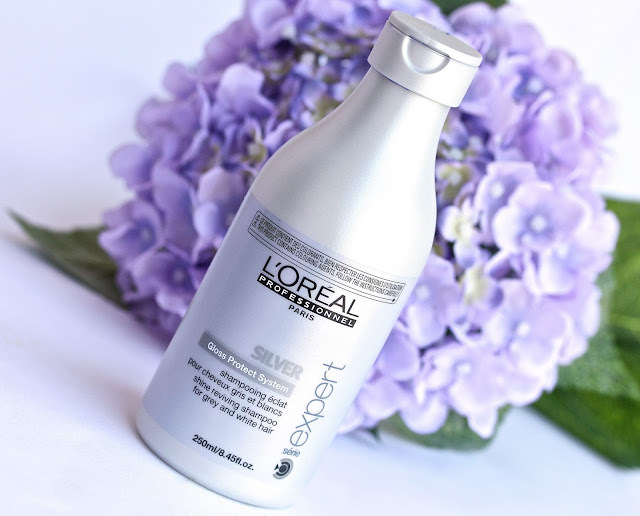 The Silver shampoo is designed to use as a toner at home, to remove the orange / yellow tones from our hair and to make it extra shiny and glossy. When you open the bottle don’t be shocked from the bright, intense purple color of the shampoo – it’s exactly what banishes the brassy tones. You may have noticed, looking at the color wheel, that the opposite color of yellow is purple. Therefore, the two colors neutralize each other and that’s why most purple-based shampoos work miracles in getting rid of unwanted yellow tones. The reason I prefer this one from L’Oreal though, is because it not only completely eliminates the brassiness (it is more concentrated than any other I’ve tried) but it also cleanses my hair really well and it’s pretty affordable. I've noticed that it makes my highlights look more defined, which is amazing! I like to use this shampoo once every two weeks and I love that its effect actually last for such a long time, unlike many others I’ve tried. The shampoo lathers really well and I like to let it sit on my hair for about 5 minutes. What I don’t really like about this shampoo is that it’s a bit drying (especially if you leave it for longer) so after using it I like to soak my hair in my favorite Macadamia Deep Repair Mask so that it’s nicely conditioned and soft and I highly recommend you using some kind of conditioner as well! (: It’s safe to say that the Silver shampoo breaks its promise to make our hair glossy / shiny but as far as it is stays ashy I’m not complaining too much. Oh, forgot to mention that a little bit of this product goes a long way, so make sure you don’t use too much because it may dry out your hair further!! I am also not really fond of the smell of this product – it’s really odd but the good thing is that it doesn’t linger in your hair after you washed it. :) Just a little heads up while using this stuff – don’t leave it on for more than 5-6 minutes because your hair may get a bit purple-y. Also make sure that you wash your hands immediately after you’ve shampooed, otherwise your hands will get stained. Have you ever tried this shampoo? What do you think of it? Which is your favorite purple shampoo? I love using purple shampoo's for my hair! My favourite is the one from Fudge Hair at the moment (I really recommend it) but I now want to try this one as this a little cheaper! Thank you so much for this review - very helpful! I'm glad I don't need toner shampoos as a brunette quite happy with her natural hair colour but it's really good there are prodcuts out there that can spare you from running to the salon too often. This is such a brilliant idea, even for those of us who are brunette and have bleached our hair (for ombre purposes) , it removes the brassiness. Thanks for the great review. Hope you had a wonderful birthday! this is a good product indeed ! Wow I did not expect it to be blue haha! Really interesting product, glad it works for you! Oh I need a new purple shampoo, think I'm gonna try this one! RYC: yeah give the Revlon lip gloss a try its sooo good! well for a drugstore i think its pretty darn good! and love your blog design very pink and cute! Man that stuff is bright purple! I've been noticing my hair getting more orange lately so will definitely look into buying this! I remember seeing Fleur and Becky talk about this in a video and it intrigued me! This was a really helpful in depth review. I'm naturally a dark blonde but I'm getting my hair rehighlighted in about a week so this is something I may pick up. Thanks for this review! Thank you for this great review! I have always used matrix as that's what we use in my salon. I may give this one a chance to see if its any better and it's cheaper than matrix! So how does it work if ur hair is blonde on top and black on bottom??? This post gets on 4liker apk download for android tools Instagram 4Liker that you post following on Facebook. In order to configuration this. After Successfully installment, you could see PokeSniper in your App gallery. Framaroot Download Particularly the snap has brought the craze to the teens for using this app.